I’ve challenged myself to write every day in April and post to my blog. It’s a big challenge for me as evidenced by the lack of posts to this site. I’m not exactly sure why I can’t write every day – I love to write. There is always the excuse of being too busy, not having enough time. But maybe I’m just not inspired? How does one find inspiration? Should I find inspiration amongst the stacks of books that surround me in this library? Have you ever realized how libraries always seemed so large? The rows and rows of books brimmed with excitement and adventure. Today, as I sit at the old wooden table and wait for inspiration to take over, I’m shocked at how much has changed when it comes to books, reading, learning and libraries. According to a recent report from the Pew Research Center, “21% of Americans have read an e-book in the past year.” More people today would rather find a book on a Nook or other electronic reader that cuddle with a good hard cover book and feel the pages. Turning pages is a whole new activity these days. And don’t think that the libraries don’t feel the change as well. I wonder how many of the books around me have been touched in the past year. As I take in the details around me, my eyes are drawn to the stacks of colored paper advertisements on the reference desk. I stop on one about the library’s program for downloading ebooks. It’s amazing that the old paper and ink fortress is now entering the digital age but more interesting is the line “…only with a valid library card…” Isn’t that some sort of contradiction? 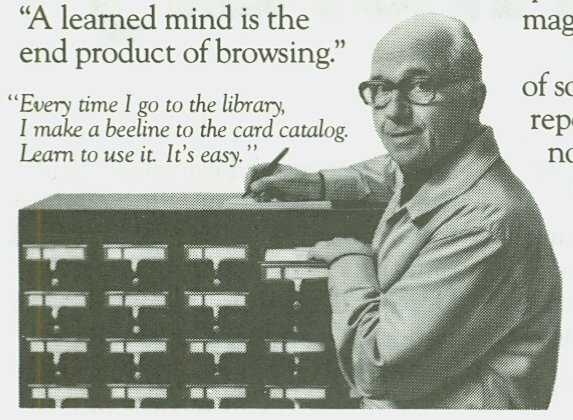 Library cards, another blast from the past. I honestly can’t say when I had my last library card. After grad school, I sort of took a break from libraries. But just in case you ever want to establish the value of your library card, there are calculators available. And, remember the good old card catalog? It’s been banished to some dark space in a dusty basement or attic reserved for antiques and replaced with a computer. A quick Google search will provide links to “11 Ways to Reuse Old Card Catalogs” or even an “Ode to the Card Catalog.” For those of a certain age, the time spent flipping through the little typed cards was the beginning of a journey. But now, anyone looking for a book in a library also needs to be computer literate. It’s the only way to find the location of a book. The computer perched on the short stack next to me has a sign that reads “15 minute Internet Access”. Even searching for a book has been cut down and monitored. What about the librarians? The older women and men, normally with thicker-than-average sized glasses, who controlled what books were removed from the library and who were more than happy to “shhh” talkative boys or girls when their voices reached an octave higher than a whisper. How do these changes impact them? They are being told to “change with the times” and to find ways to adapt. Changing and adapting are terms we’ve all become used to hearing given today’s economic situation but as the Globe and Mail said in 2010 libraries are recession proof because they’re free. But the article goes on to talk about how in some libraries in Canada, they are adding bars and wireless Internet hotspots. The normal quiet haven of the library is now getting into technology age. I guess you can call that adapting, right? I’m not sure what will happen to the libraries around the country or the world for that matter. I’m not sure if I want my local library to resemble a Barnes and Noble with a coffee shop or the local corner bar. One thing I am sure of is that despite the changes and challenges of the libraries, being here, in the stone-cold silence, sitting on this old rickety chair, looking at the stacks of books, I have taken a trip down memory lane and found the inspiration to put pen to paper (or, if you prefer, fingers to keyboard). Inspiration can come from anything. What inspires you to read and write? Has technologies rapid growth killed you love for paper, ink, and the binding of books? Have you stepped inside a library lately and been a bit disappointed about how small it feels? I’m glad you decided to post everyday because this blog was excellent. Your right about library catalogues – I find them re purposed on etsy.com all the time and love how they make them into cards or postcards. It makes me happy even though it’s because they’re mostly dead and forgotten. The e-book craze makes me sad because I love to be in the stacks. The only thing that I hate about the stacks is imagining all of the books I will never read.